The key to good science fiction is that it doesn’t just have to be set in the future with some cool tech and characters questioning the status quo, it also has to be believable. 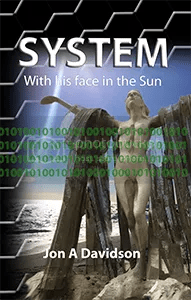 Jon A. Davidson’s debut novel, System: With His Face in the Sun, the first in a planned trilogy, does exactly this: taking our current tech and knowledge and pushing it further into the future in a logical way that makes everything totally believable and seemingly inevitable. We are at a point in the future where the world has changed. The System now controls everything; think of it as a sentient Internet that tells you what to do. Almost everyone on the planet is connected to the System through their CommCuffs, and the System lets you know how to get anywhere, what you should be doing to make yourself feel better, and whether your marriage is worth it. The seas rose, and things went to hell, so the System was developed to fix things, which it did, shrinking the population through some secret, not so liked means, and making the world a much better place to live. Now everyone lives their lives guided by the System, and, while it’s not illegal to disagree with what the System tells you, you might disappear from society if you disagree too much, because the System is never wrong. Wallace Blair thinks everything is going just right in his life. He has a wonderful wife he loves very much, a job he really enjoys that makes him be creative and somewhat individual, a unique facet in the world of the System, as well as two kids and a lovely home. And then one day the System lets him know through his CommCuff that he and his wife are in Transition, meaning their marriage is about to end. Wallace doesn’t accept this, knowing he’s perfectly happy in his marriage, but the System is never wrong. His wife fully believes their marriage is over once she gets the same announcement on her CommCuff, and this begins a long and interesting journey for Wallace. He confronts Arthur, his father, who is a highly-ranked worker in the System, about why this is all happening to him. The trail leads him to discovering his grandfather, Edward, apparently isn’t in a care home with dementia, but living hidden away in an abandoned town in Spain, completely disconnected from the System. 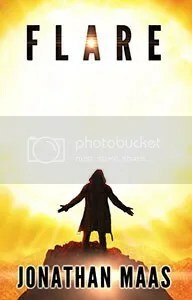 When Wallace eventually finds his grandfather, he learns a lot about why the man chose to keep his life secret, and upon returning to London, everything changes for him, as the System comes for him. For a self-published work, System is a surprisingly well-edited and copy-edited work of fiction. While there is a couple of typos and the occasional grammatical error, the flow and voice feel like something published by a big publishing house. The science is interesting and believable, and the book never really slows down, as the reader is hooked in wondering where it will go next. The reasoning and reveal at the heart of System is just as entertaining and enthralling as any other work of good dystopian science fiction. It can best be described as The Matrix meets 1984. Originally written on June 20, 2015 ©Alex C. Telander. To purchase a copy of System: With His Face in the Sun from Amazon, and help support BookBanter, click HERE. Flare by Jonathan Maas is one of those doomed futures that, in some ways, seems almost foreseeable. During the day, the world is now an inhospitable place for people. Due to unknown means, an extended solar flare is bombarding the planet, causing temperatures to reach new and lethal heights. Any skin that is exposed to the sun during the day immediately burns, as if it were stuck within the flames of an extremely hot fire. Many have died across the planet, but there are some who have survived. They have been forced to become nocturnal, and it is a much changed and harsh life where the only way to survive and not become like the other dead is to adapt. Ash awakens to find himself living within the world of the flare. He serves as a great introductory device for the reader, as he remembers little at first, but soon finds his twin sister, who explains what has happened to him. They are now hiding in a house away from the sun, trying their best to survive. The windows and openings have been boarded and blocked with mattresses, and anything else that could be found to block the lethal rays, for a small sliver could cause painful burns. Heather, his sister, is looking after a man she cares greatly for, who has been horribly burned, but is somehow still alive. It serves as a symptom of the way things are now in this world. The man, a doctor, is dying, and there is nothing that can be done for him, he simply lives in a world of nonstop pain. At night, the world becomes a different place again, as the survivors venture outside in search of nourishment and resources. It has become a dog eat dog world, and Heather and Ash have to be careful, and defend themselves when necessary. In a convenience store, they meet Raj who reveals that there are survivors out there who know why all this has happened; who may, in fact, be behind the cause of the flare. He shows them special papers that can withstand the flare that are puzzles. Ash is a gifted individual, who begins working on the puzzles. They are unable to find Raj again, but do discover more of these puzzles. Ash continues working on them, and begins to solve the riddles locked within. They point to a secret location called Salvation, where survivors can live some semblance of a normal life. So Heather and Ash set out to find this special place. Then, there is Zeke. Another character who has his own ability to deal with the flare. He is unique in that his skin is almost black, and while he cannot survive in the direct sunlight, he can withstand small amounts of sun, and sets out on his own journey meeting different people along the way, and eventually learning of Salvation. But Zeke’s journey is a far more grueling and harsh one, compared to Ash’s, as the reader gets to see some of the truly despicable examples of humanity left in this world. There are some very good things about Flare. While at times the characters feel a little artificial and robotic, they are still interesting. Animals have developed certain techniques to adapt to the flare and survive, as have certain plant life and cacti, which is fascinating. But, at times, the book seems to go to a dark place, just for the fun of it, such as with Zeke’s plight in experiencing the worst of humanity that just feels over the top and unnecessarily gruesome. There is also the constant use of religious names throughout the book that never really get explained. While the ending does leave the reader somewhat satisfied, it also feels somewhat lacking, as Zeke and Ash never come together as had been presumably hinted at throughout the book. Overall, through the ups and downs, Flare is still an interesting read that presents a different take on the dystopian end of the world genre that continues to be popular. Much like The Walking Dead, it is not a story about this terrible event, but about how people adapt and survive, just as we have for millions of years. Originally written on June 3, 2015 ©Alex C. Telander. To purchase a copy of Flare from Amazon, and help support BookBanter, click HERE. 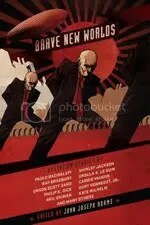 There have been a number of science fiction anthologies released over the last few years, and a good portion of them were on the subject of dystopian worlds. A future time where things don’t look so great, but the characters in the stories have hope for something better. 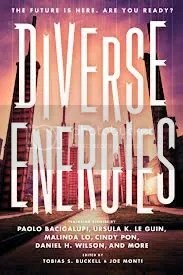 But none of them are anything like Diverse Energies edited by Tobias Bucknell of British and Caribbean heritage. In the introduction, Bucknell talks about growing up and loving science fiction, but was always disappointed how the covers featured tough white guys with chiseled chins; that none of them ever looked like him. So when he set out to put Diverse Energies together, he was looking for diversity in every story. “The Last Day” by Ellen Oh is set in a dystopian Japan where the world is at war and the children fear the next explosion will wipe out everything. “Next Door” by Rahul Kanakia is a world where the rich and well off are hooked into their virtual worlds, while the poor squat in their homes trying to eke out a living; in this story two boyfriends search for the ultimate place to live. “Good Girl” by Malinda Lo is about a relationship between two girls set in a world where races need to be pure otherwise people will become infected with a lethal illness; at least that’s what the government is telling them. The high point of the anthology is “Uncertainty Principle” by K. Tempest Bradford about a girl whose world keeps changing and she’s the only one who knows it’s happening. The collection also features stories from Paolo Baciagalupi and Ursula LeGuin. Diverse Energies features no stories with tough white dudes and their chiseled chins. It features real people, from all walks of life, from all classes, from a number of different races, nations and cultures. The plots are unique and interesting encompassing many different worlds, and while all of them are of a dystopian nature, some have a little more hope and possibility than others. Diverse Energies is an anthology like no other, which is exactly why you need to read it. Originally written on December 9, 2012 ©Alex C. Telander. 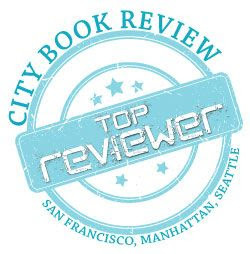 To purchase a copy of Diverse Energies from Amazon, and help support BookBanter, click HERE. It’s the future. A dystopian future where everything has pretty much gone to hell. Our main character is Avery Cates. Cates is not a good guy, in fact he’s a very bad man. He’s a professional killer who goes through life assassinating people for what money he can get to survive. While the police know about Cates, he’s very good at not getting caught. He’s developed quite a reputation in fact. Then there’s the Electric Church. A religious group that is growing into a world-dominating force, gaining members and converts daily. It’s members are known as Monks: cyborgs that still posses a human brain. When one meets a Monk – a scary-looking thing with wires coming out of its head – one is immediately scared stiff, as the Monk calmly and pleasantly engages you in conversion, telling you the merits of the Electric Church and why you should join. Cates is set-up and is captured by someone high up in the police authority. He’s been caught for a reason: to be offered a deal, a hit. In exchange for a large amount of money and his freedom, he is to assassinate the head of the Electric Church. Why? Because to convert someone to the Electric Church involves killing the person and taking their brain. There’s a reason the Electric Church is growing so quickly, and eventually will simply take over the entire population, unless Cates can do something about it. Written with the swagger and toughness of Blade Runner meets Stanley Kubrick, author Jeff Somers gives Cates a very unique and individual voice, setting the tone for The Electric Church, where anything can happen, and you need to keep reading to find out what’s next for Cates. The story continues in The Digital Plague, The Eternal Prison, and the forthcoming The Terminal State. Originally written on January 11th, 2010 ©Alex C. Telander.